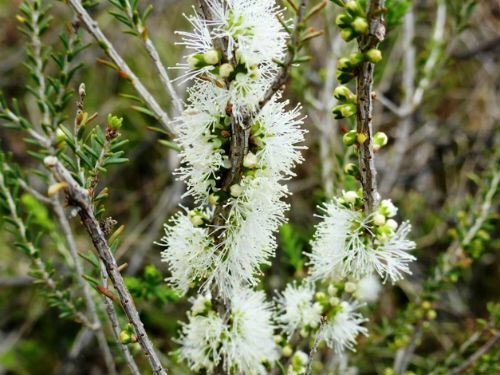 Melaleuca brevifolia is known as the Mallee Honey-myrtle and is said to be a medium to tall shrub. Our specimen, growing in rather harsh conditions in our cold climate garden, is just over one metre tall and is about 8 years old. Leaves are small, narrow, about one centimetres long, tightly clustered and spirally arranged around the stems. An unusual feature is the two rows of glands on the under surface of the leaves (see image x 10). White or cream flowers are arranged in spike-like inflorescences usually on older wood. Flowering occurs in spring and summer. Blooms are very showy. Pruning, after flowering, prevents plants becoming straggly and improves the floral display. The Mallee Honey-myrtle has a rather disjointed distribution. The species is found in southern Western Australia then reappears in southern South Australia, including Kangaroo Island and extends into southern Victoria. The species was known as Melaleuca neglecta and Melaleuca oraria. The type specimen appears to have been collected on Bald Island part of Waychinicup National Park, east of Albany in 1862.